Every parent's dream is to see their children grow up and become these amazing human beings they'll be proud of. Being a parent myself I can say my biggest happiness in life is seeing my children happy, content and smiled and I'll do just about anything to make that happen – and I bet that so will you. An important date in everyone's life, especially children's is their birthday. When they're little, up to a year or two, they don't really know what exactly is happening and why there are so many people staring at them, flashing cameras in their faces, trying to take a few photos. This time frame is when you are completely on your own and all the fun you make is either for show or for the experience and photos you'll be showing your precious one one day, telling them how gorgeously you've celebrated their first birthday. But, once they get a little older (age 3 and up) – this is when the real drama starts. At this time, they already know what they like and how they want it and you're there to oblige. It's not as bad as it sounds, really – if anything, it's more fun because you can actually consult your young one on the decisions you are going to make. From my experience, kids want nothing pompous but rather something simple and fun, a space they'll play at with their friends all they long. Obviously, you need to organize everything with their needs and tastes in mind, but that's okay. Here's the best guide for throwing a party that is fun for everyone, even the adults. Before spending your money and time on figuring out what sort of a part your kids want – ask them! You'll be surprised how open and upfront they are about their wishes. They'll gladly choose the party's theme and activities (hint: don't get surprised when they name their favorite cartoon as theme) and can even help design the invitations. If your child is creative and enjoys expressing him/herself through drawings, you can have him or her draw and color on paper for a personal touch. If you feel like they'll get tired or bored with this activity, just ask them to stamp their favorite stamp on the invitation, sign the card, leave a kiss pattern, or anything similar. 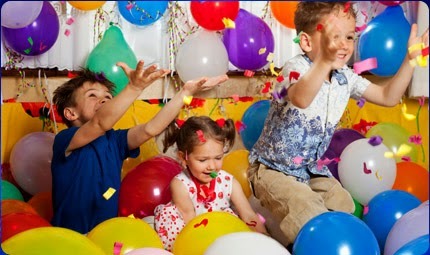 For a children's party, two or three hours is plenty of time and usually more than enough. Unlike adults, kids don't need much time to warm up to their environment, especially when they are coming to a party of their friend's. They go straight into it, not wasting a second of the opportunity to play and eat cake! Downside to planning a kids' party is that most children get bored soon. This is why you should keep the party short and structured. The main event should begin as soon as most of the guests arrive (it's important to be specific and clear about the party's beginning and ending on the invitation), keeping everyone busy from arrival to departure. It's best to serve food and cake in the final half-hour. If you serve it straight away, children may get sick running around and jumping with their stomachs full. Also, plan age-appropriate activities – don't experiment with new stuff. Stick with familiar games, things you know children of that age love. Use cookie cutters to make sandwiches in various shapes, such as flowers or stars or any other shape your child suggests. Turn Jell-O into letters of the alphabet or interesting shapes. Serve foods that are easily grasped by small hands and don't require cutting. Once you or your child have chosen a theme, make sure it resonates through all the aspects of the party. For instance, if your little girl has chosen Cinderella for her theme party, send out invitations pointing out a cartoon dress code is desirable, make a cake shaped like a castle, a crown or Cinderella herself (anything else from the cartoon works, too), add some sparkle with decorative lights, etc. As for costumes, you don't have to worry that it'll take months for both you and other children's parents to make one – there are now Disney costumes online that are available at any time and aren't pricey at all! Hopefully, this blog will make it easier for you to organize your little one's party! These party planning strategic moves have helped me with my kids, numerous times! Well, at least till they got older and decided their parents aren't cool anymore! Involve our child in some planning increase emotional quality of relationship between children and parents.